Researchers at the Beckman Institute are using a novel technique to test brain waves to see how the brain processes external stimuli that do and don’t reach our awareness. Have you ever accidently missed a red light or a stop sign? Or have you heard someone mention a visible event that you passed by but totally missed seeing? But say there’s an unexpected event: an emergency vehicle, a pedestrian, or an animal running into the road—will you actually see the unexpected, or will you be so focused on your initial task that you don’t notice? By using a novel technique to test brain waves, Mathewson and colleagues are discovering how the brain processes external stimuli that do and don’t reach our awareness. A paper about their results, “Dynamics of Alpha Control: Preparatory Suppression of Posterior Alpha Oscillations by Frontal Modulators Revealed with Combined EEG and Event-related Optical Signal,” published this month in the Journal of Cognitive Neuroscience, reveals how alpha waves, typically thought of as your brain’s electrical activity while it’s at rest, can actually influence what we see or don't see. The researchers used both electroencephalography (EEG) and the event-related optical signal (EROS), developed in the Cognitive Neuroimaging Laboratory of Gabriele Gratton and Monica Fabiani, professors of psychology and members of the Beckman Institute’s Cognitive Neuroscience Group, and authors of the study. While EEG records the electrical activity along the scalp, EROS uses infrared light passed through optical fibers to measure changes in optical properties in the active areas of the cerebral cortex. Because of the hard skull between the EEG sensors and the brain, it can be difficult to find exactly WHERE signals are produced. EROS, which examines how light is scattered, can noninvasively pinpoint activity within the brain. This allowed the researchers to not only measure activity in the brain, but also allowed them to map where the alpha oscillations were originating. Their discovery: the alpha waves are produced in the cuneus, located in the part of the brain that processes visual information. The alpha can inhibit what is processed visually, making it hard for you to see something unexpected. By focusing your attention and concentrating more fully on what you are experiencing, however, the executive function of the brain can come into play and provide “top-down” control—putting a brake on the alpha waves, thus allowing you to see things that you might have missed in a more relaxed state. “We found that the same brain regions known to control our attention are involved in suppressing the alpha waves and improving our ability to detect hard-to-see targets,” said Diane Beck, a member of the Beckman's Cognitive Neuroscience Group, and one of the study’s authors. The study examined 16 subjects and mapped the electrical and optical data onto individual MRI brain images. 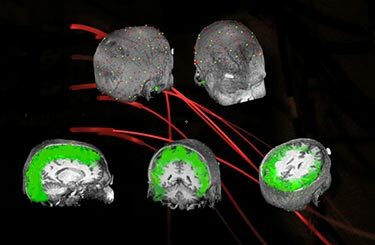 Other researchers on the study include Ed Maclin and Kathy Low, from the Cognitive Neuroimaging Lab, and Tony Ro, from the City College of the City University of New York. Funding was provided by the Natural Sciences and Engineering Research Council of Canada (NSERC), the Beckman Institute, and the National Institute of Mental Health (NIMH).